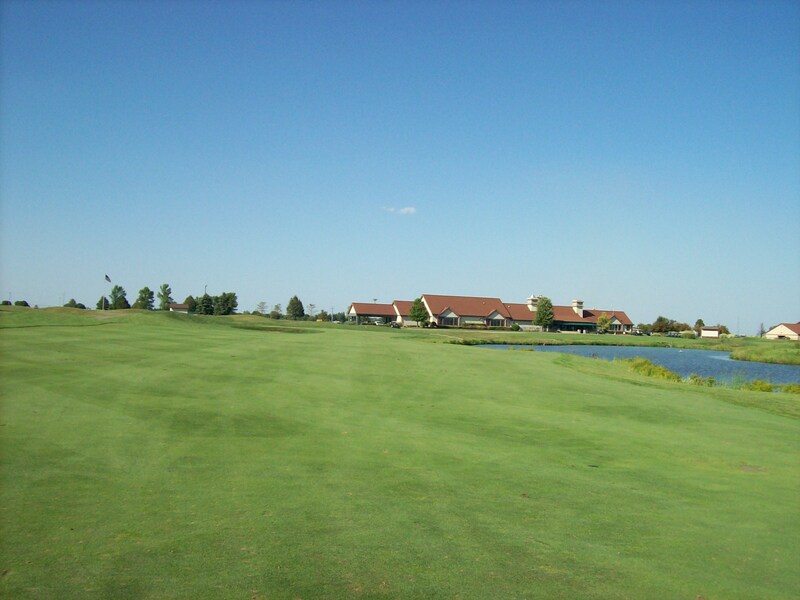 Prairie Bluff Golf Club is located in the southwest suburb of Crest Hill is a perfect reason why it’s great to be a Chicago golfer. 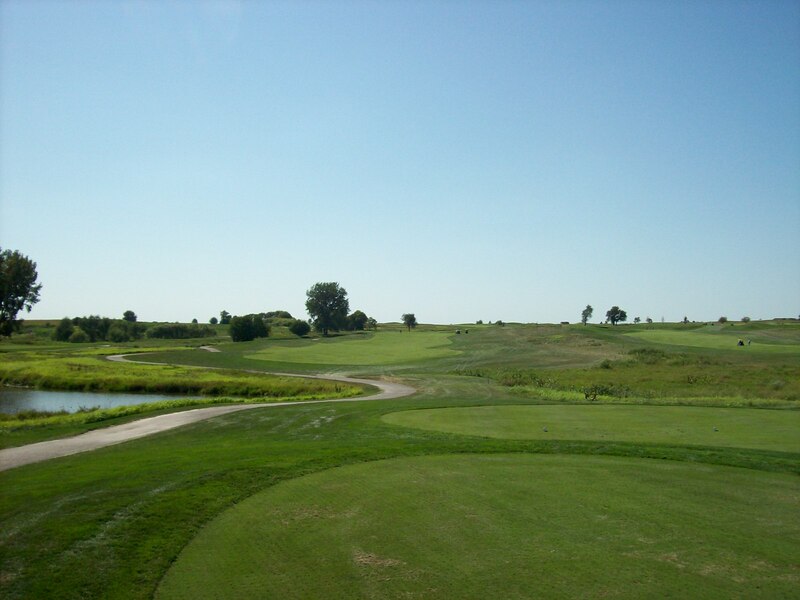 Designed by Roger Packard and Andy North, Prairie Bluff opened for play in 1998 and is located less than 30 miles south of downtown Chicago. 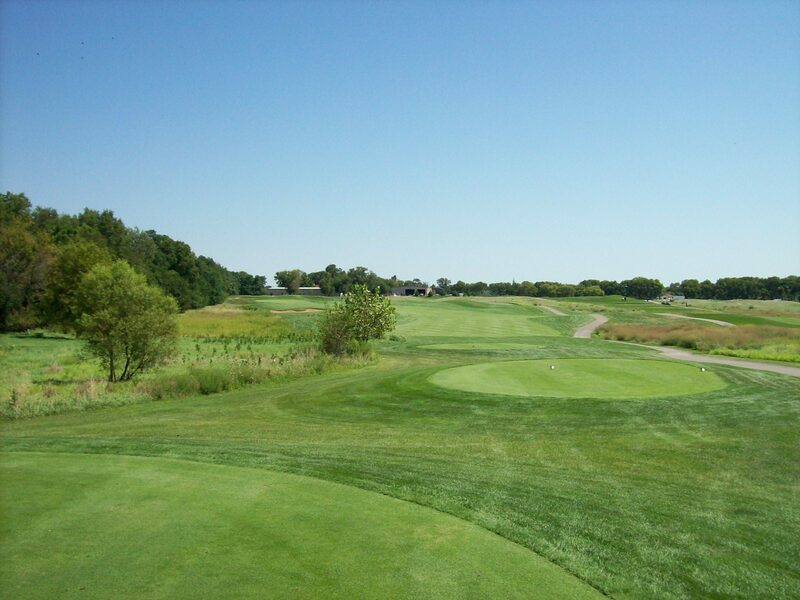 This course is a tremendous example of a Chicago golf facility that has something for everyone. Frequent visitors to Prairie Bluff are familiar with its views of the adjacent Stateville Correctional Center, which is located just south of Division Street in Crest Hill. 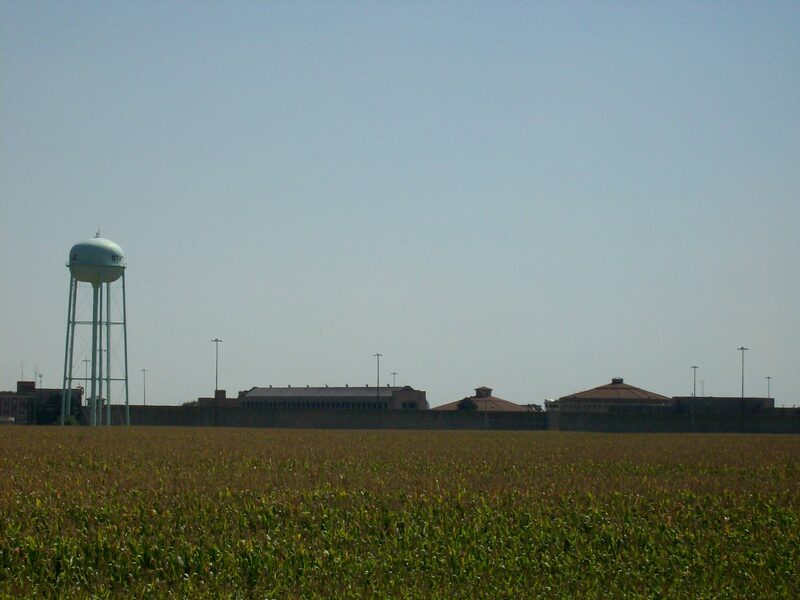 Opened in 1925, Stateville now holds about 3,500 inmates and employees 1,300 people. 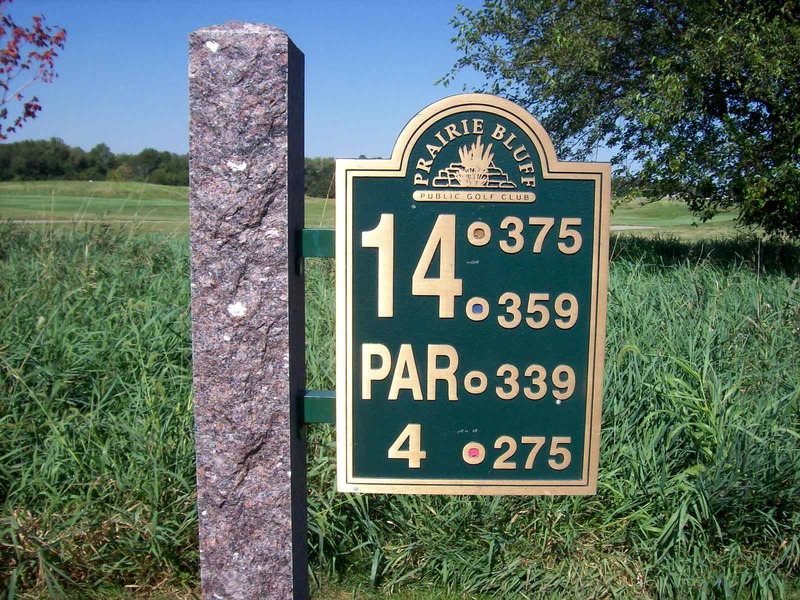 From the tips, Prairie Bluff plays at just over 7,000 yards and can be a test, especially when the wind whips across this largely open-style course. However, the tee shot landing areas are often wide and forgiving. Even if you’re not a big hitter, keep the ball in the fairway on this course – from any tee – and you have a shot at posting a good score. 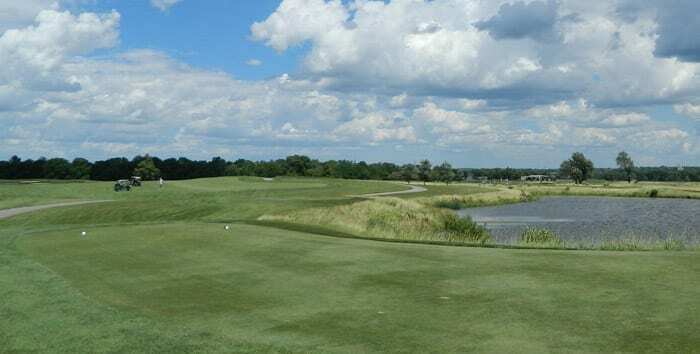 In addition to its tough but fair playability, Prairie Bluff Golf Club is always one of the more well manicured courses in the Chicagoland area. Supervisor of Golf Maintenance Luke Strojny has his work at this course down to a science, with the wide fairways always in great shape. 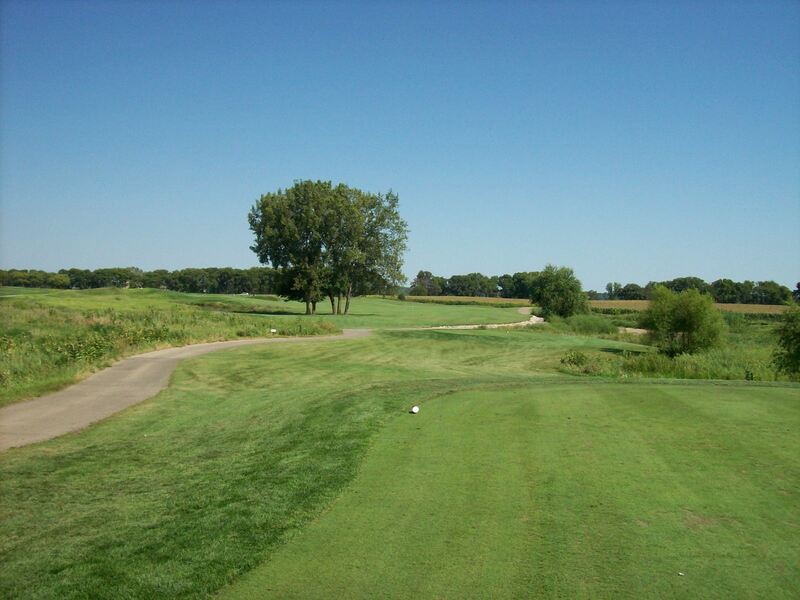 There aren’t many trees at Prairie Bluff, making it a bombers’ paradise to take advantage of the ample fairways and huge greens. However the lack of trees is also gateway for the course’s greatest protector, the wind. 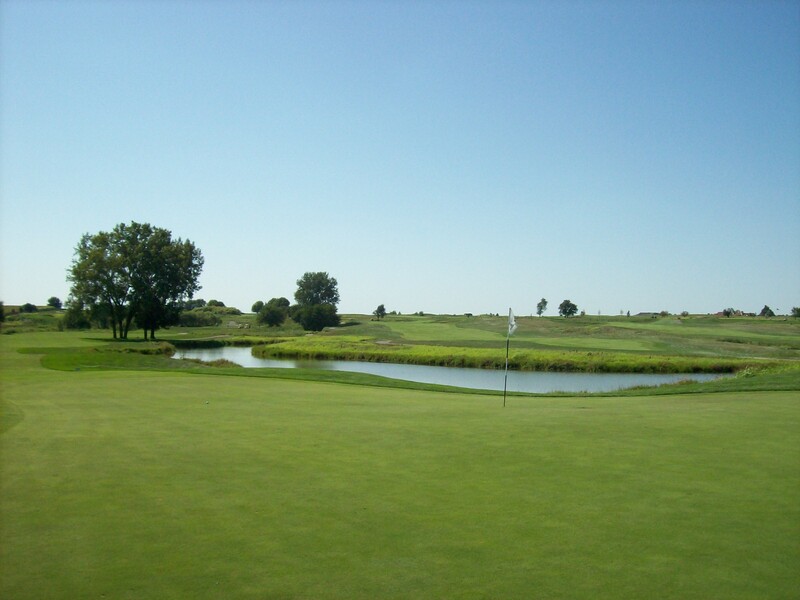 With a howling wind, many of the holes at Prairie Bluff Golf Club change their complexion dramatically. Short irons into greens become fairway woods and the scattered fescue found in between many of the holes suddenly becomes much more popular. 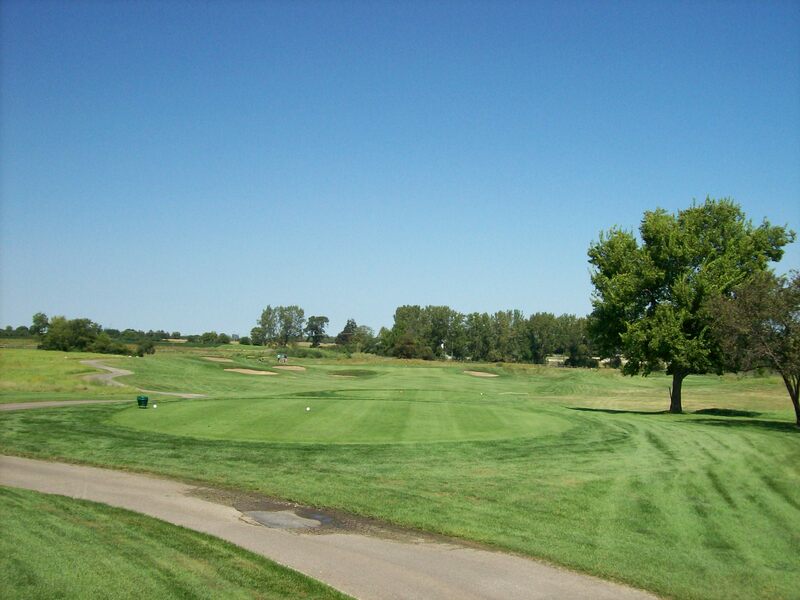 Golfers are welcomed to an opening hole that offers a wide landing area and is 413 yards long from the back tees. This is a great introduction to the course and the elements as you’ll get your first glimpse of the strength and direction of the wind. If you’re fortunate and the wind is low, it’s time to play aggressive. The first green is protected by a bunker short and to the right. 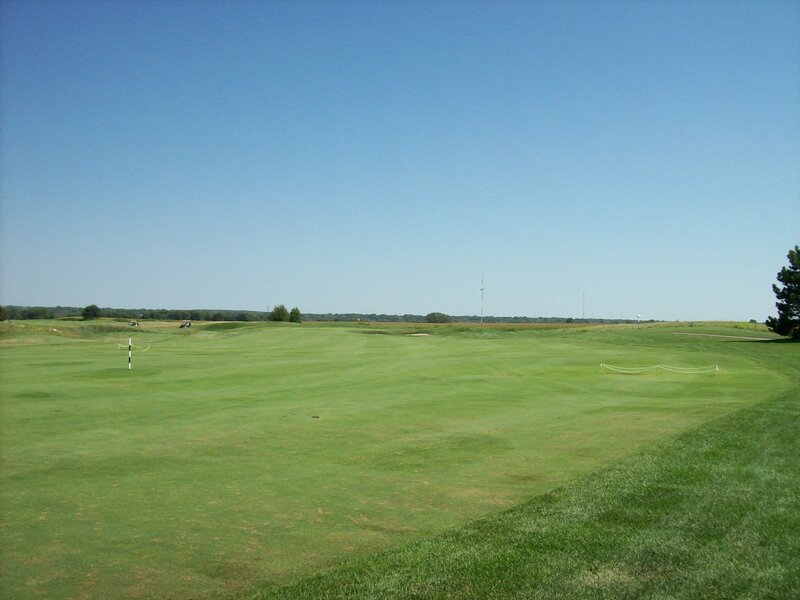 However, the green is plenty wide, so there are plenty of options to miss your approach that don’t include sand. 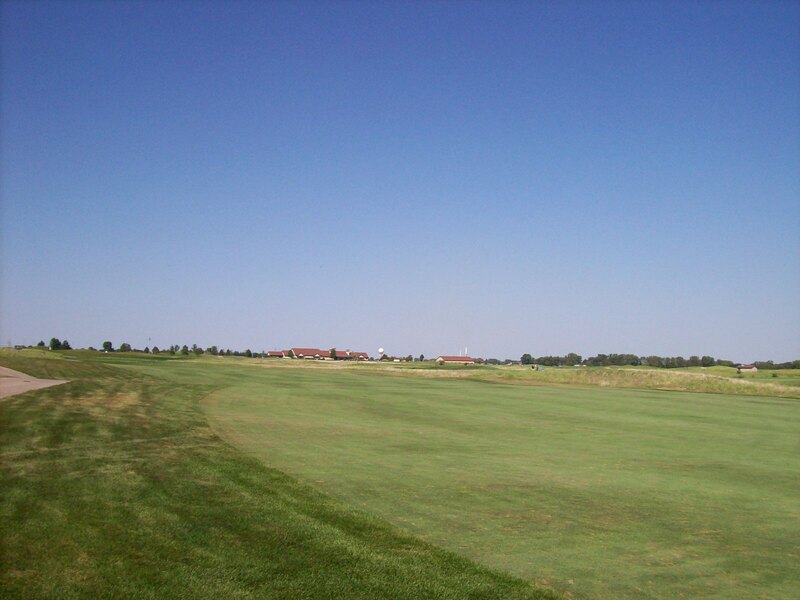 The second hole is a 369-yard par four with a dogleg to the left. It’s possible to drive through the fairway and find yourself with a downhill lie, so be sure to choose your weapon wisely off the tee. A great approach position is at the top of the hill so you can see the green, which lies across a crevasse from the fairway. This can be a somewhat intimidating approach since there are a variety of bad places to miss. If you’re short, you’re hitting up the hill and may not have a view of the pin. If you’re long left, the green slopes down so it can be difficult to keep your chip shot close to the pin. 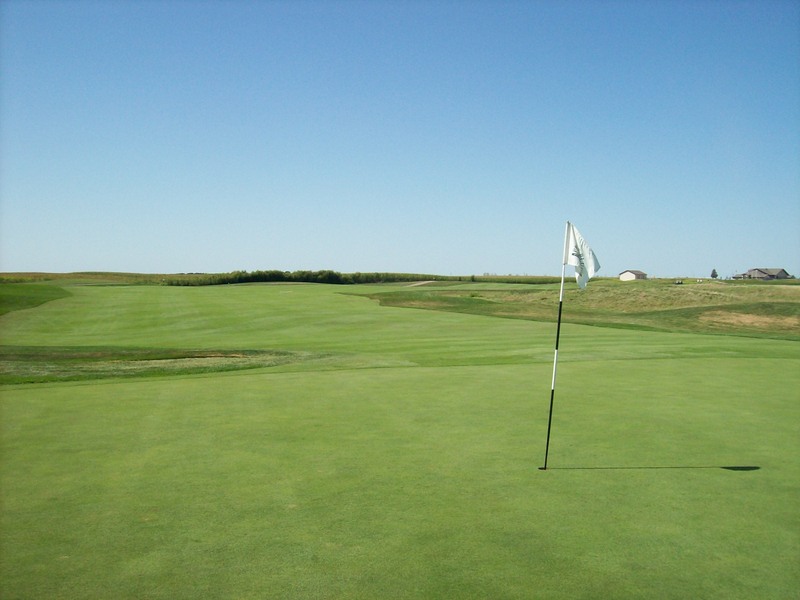 One saving grace is this green is big – just like most of the putting surfaces at Prairie Bluff Golf Club. The number one handicap hole on the course is the par four, 448-yard 7th, which plays uphill. 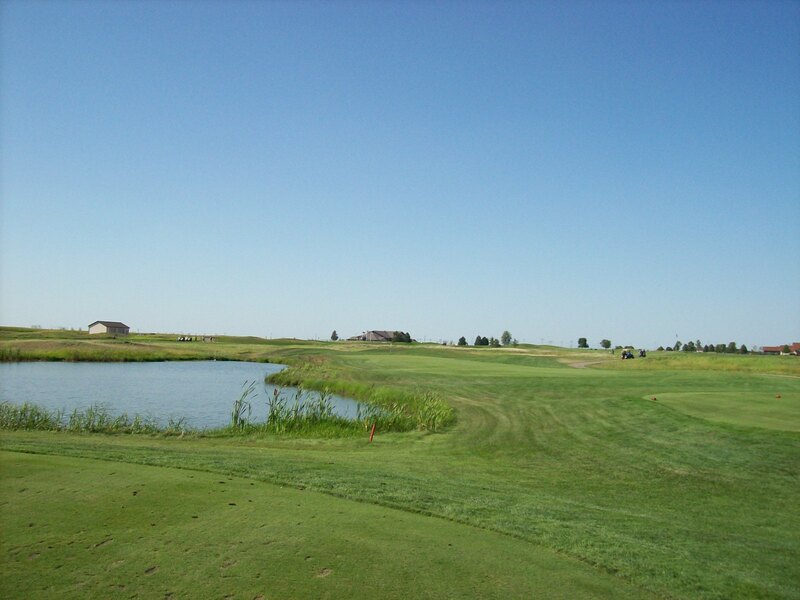 It seems like the wind is often blowing into your face on this elevated tee box, so a long, straight drive is a must. The rough is pretty thick and the fescue comes into play if you miss the fairway here. There is a bunker protecting the left side of the green that sees a lot of action since most golfers are hitting at least a long iron up the hill to this green. Since you don’t get a good view of the pin from the fairway, finding the right club for this approach shot can be challenging. In addition to the bunker, the green is protected by large moguls on the right and to the back. Since this putting surface sits high, the sun and the wind typically make this one of the faster greens on the course. If you’re long with your approach, it can be quite difficult to stop anything but the highest-lofted chip shot facing downhill. The par four 378-yard 14th hole is a highlight of the back nine, featuring a dogleg left around a massive tree that also shields a pond on the left. Anything left here is bad since both hazards can come into play. 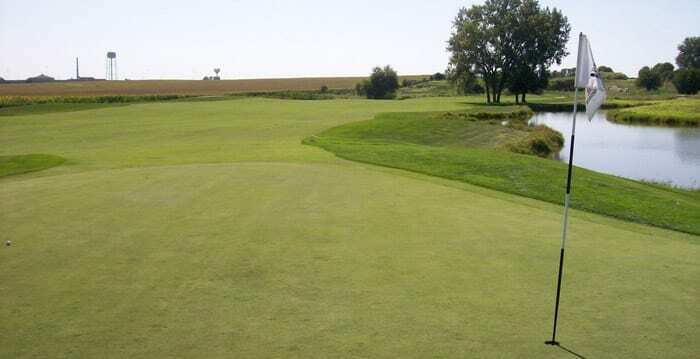 A solid tee ball will find the right side of the fairway, setting up a good angle to this raised green that is protected by water to the left and a bunker to the right. Once again, you’ve got to pull the right club or there are a host of bad options that come into play. 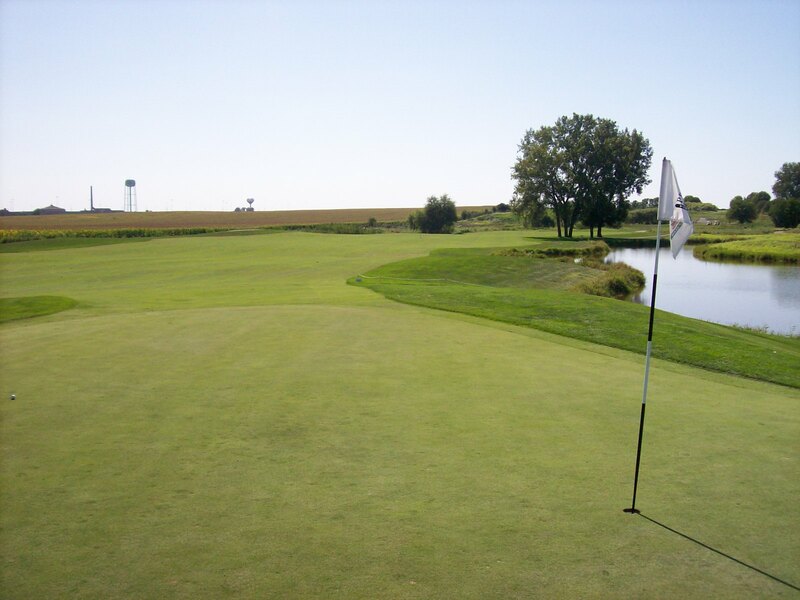 Like most of the greens at Prairie Bluff, there are slight undulations, but the putting surfaces roll true. After a few holes, you’ll learn to respect the green speed, but don’t look for more break than you might expect. At Prairie Bluff, you’ll come for the golf, but you’ll stay for the food. Even if you’re not playing golf, a visit to the popular P.B Mulligan’s restaurant at Prairie Bluff is worth the trip. The restaurant features a diverse menu and the outside patio provides an expansive view of the golf course.